Short on cash? Sell something! Sounds simple right? But where and how do you sell something? Today for my find an extra $100 a day challenge I decided to see what I could sell. I was pretty broad with my definition of ‘sell’. I figure I could sell items I have that I no longer want, reinvest some of the money made or saved so far into buying something to resell, sell space (I’ll explain further down) or make something to sell. 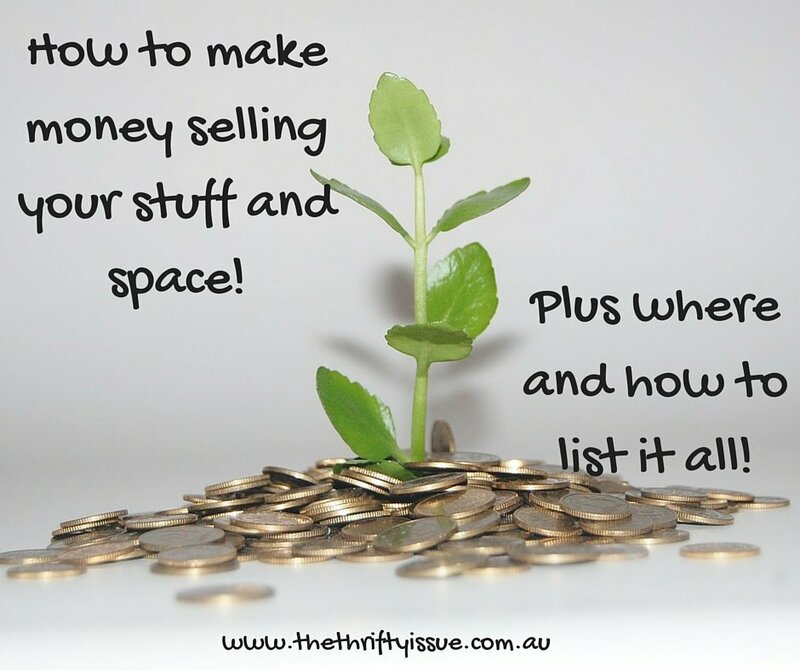 I decided on 2 options – list what I have and sell space. 1.) Go through your home, pull out everything you aren’t using or don’t need that is in decent condition. 4.) Write a great description and offer combined postage plus state if the items come from a smoke free and pet free home. A few things like that can sometimes be the difference between a buyer choosing your listing over someone else. 5.) Check postage rates and options so you don’t get stung with losing what you made from selling on postage. 6.) List it for sale. 7.) Be available to answer questions, update the listing if needed and promote it a little across your other networks. 8.) Package neatly once it has been sold and paid for. Never post before you have received payment. Write a great review and put the money on debt or in savings. 1.) Gumtree – Gumtree I tend to get more enquiries than eBay and have had a 50% success rate. It is faster and easier for me to list there than eBay, not to mention cheaper. It is usually sold to locals so no postage or messing around either, so generally a faster transaction. 2.) Craigslist – I have only sold 1 item and don’t really use it anymore. It is simple enough but I think more successful in the USA. 3.) eBay – eBay has become rather expensive compare to other listing options and not as successful as it was for me a few years ago. Still a good option, but not my fallback option anymore. 4.) Classified papers – online trading papers can sometimes be good, especially if it is a niche item. 5.) Facebook – personal profile – create an album and list in your personal profile things you have for sale. Leave the album open so friends can share it if they want or they might want to tag people they thing will be interested. 6.) Facebook buy sell and swap groups – look up groups in your area and list your items according to their rules. 7.) Facebook niche groups – Along with buy, sell and swap groups for local areas there are groups that are quite niche such as vintage clothing, fabric, make up etc that you can list in and target an audience specifically looking for what you are selling. 8.) Outsourcing the sales – pay someone else a percentage or a flat fee to list your items for you. 9.) Market – check out markets, school fetes and car-boot sales in your area you could sell your items at. 10.) Garage sale – if you have a lot, have a garage sale. It takes a bit of time and can be hit and miss. I have made a few hundred at times doing this. People often haggle and want discounts, so be prepared for that. 11.) Second hand or pawn stores – you get virtually nothing for selling your items but they are fast. Don’t pawn your stuff though, only sell it. 12.) House signage – put a sign out the front of your house if you are selling things from home such as lawn mowers, a car, pot plants etc. 13.) Email – shoot out an email to your friends and family listing what you have for sale, provide an album link with pictures and prices. I mentioned listing space as an option to sell. I have a spare room so I listed that on Gumtree and have a few people looking at it this week. There are other ways to ‘sell space’. 1.) Rent out a room – you can have a boarder if you have a spare room or rent it irregularly on sites such as AirBnB or rent the room to a photographer for a photoshoot, to TV studios or any business that might want to use the space. Get creative, you could even rent it out as an office. 2.) Rent your driveway – if you have space in your driveway you can rent it to people to store their caravan or boat or if you are near offices or tourist attractions you could rent it as a carspace for a regular price. 3.) Rent out your garage – similar to the driveway and renting a room, a garage can make you good money through people storing items or if someone wants to use it for work. I rented mine to a seamstress once who wanted somewhere set up she could work and to store her fabrics away from her young kids. 4.) Convert space to rent out – if you have spare space, can you convert it to rent out. For example, a dining room might only need a wall to then be rented as a bedroom. 5.) Garden allotments – rent allotments in your garden for others to grow things. 6.) Pool – the pool can be used for swimming lessons or rented to a swim instructor or personal trainer to run sessions. 7.) Garden space for caravans etc – similar to the driveway, rent the space for storing caravans and boats or rent the space for parking. 8.) Attic or basement – rent out these spaces for storage, the basement could be rented for parties, or for a cheap place to sleep etc. The basics of selling space are have a contract, set your price and work out what you are comfortable doing. Some people are ok with renting a room, others prefer no one in their space. Make sure you are doing everything legally right with your local area, have the necessary permits, paperwork and insurance! Otherwise, it can cost you more than you make. I am selling off a lot of the things in my home and managed to sell $1,550 worth with one Facebook post. I have more to sell and am deciding how best to do that. Current total – $2,330! Plus, whatever else sells out of what I have planned. This means I have managed to make or save well over my desired average of $100 a day so far. What could you sell or what tips do you have for selling?